To be able to carry more stock and to save on feeding through the dry autumns. What grazing and pasture benefits have been observed? Stock supported on strip grazing through the dry periods as well as giving a break for the other pastures. To be able to run 3-4 times more stock per acre and to have good ground cover all the time. 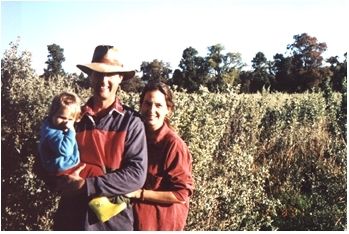 We can graze the bush every 8 10 months which fits in well with the property. What financial benefits have been observed? Were able to carry extra stock on the property and to keep them longer before selling. Not loosing money from buying feed. Biggest OMSB impact? Can now sell our hay and oates as we no longer have to feed our stock. We are becoming more profitable. Any problems with OMSB? A few plants on the hard ground died. It takes a bit of effort to get the establishment right. Do you / if you had a salinity problem, do you think OMSB would help with controlling deep drainage and/or lowering the water table? Yes. What limits your planting of a larger area? The main limit is farm area as cost is not an issue. The financial benefits of putting it in make it more than worthwhile.